The forum will analyse the maritime transportation of oil, gas and dry bulk commodities, the offshore and containers ongoing developments, the “renaissance” of the shipping and commodity markets, the geopolitical risks, the upcoming industrial and technology post-crisis “revolution”, the regulations and the environmental imperatives, the 2020 IMO regulation, the future of the global shipping hubs and the Singapore maritime Cluster, and views on smart ship investments and Ship finance. Are you in shipping, trade and ship finance, and want to know what will happen next? 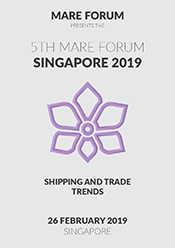 Come to the 5th Mare Forum Singapore conference and will find your answers there. Dimitris	Belbas	Managing Director Seafin Pte Ltd. The Mare Forums bristle with ideas and dynamic debate; high-level speakers, session chairmen, discussion panelists and audience will contribute to a day packed with knowledge transfer, exchange of visions, experience and stimulating discussions. The openly approach of this type of Mare Forum conferences produces a wonderful environment for brainstorming, sharing and improving knowledge and intelligence.